Leaving your dog at home alone for 15 minutes while you run to the store probably seems like no big deal. But for dogs, those 15 minutes can feel like an eternity. 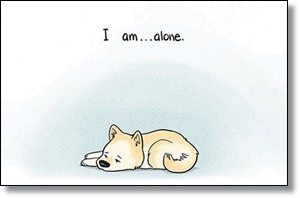 Comic artist The Pigeon Gazette humorously illustrates the quiet desperation of a dog who has been left home alone.